This hilarious, family-friendly leap from the page to the big screen stars Griffin Gluck (Batman vs. Robin) alongside Lauren Graham (TV’s “Gilmore Girls”), Rob Riggle (The Hangover), Thomas Barbusca (TV’s “Wet Hot American Summer: First Day of Camp”), Andy Daly (Semi-Pro), Adam Pally (Dirty Grandpa), Isabela Moner (TV’s “100 Things to Do Before High School”), Isabella Amara (The Boss) and Alexa Nisenson (TV’s “Constantine”.) Rafe has an epic imagination…and a slight problem with authority. Both collide when he transfers to a rule-crazy middle school. Drowning in do’s and don’ts, Rafe and his best friend Leo hatch a plan to expose the principal by breaking every rule in the school’s Code of Conduct. As the principal strikes back, Rafe’s world, at home and at school, explodes into hilarious chaos (both real and imagined) in this laugh-filled family comedy based on James Patterson’s best-selling book series. Rafe Khatchadorian (Griffin Gluck) has more than a long last name to deal with. He is starting a new school, after being kicked out of many others. Rafe must have a problem with authority, but he seems like a nice enough kid. His mother Jules (Lauren Graham) is a single parent doing the best she can with Rafe and his sister Georgia (Alexa Nisenson). Rafe is an artist who often stays up all night drawing. On his first day of school his mother finds him in bed, having pulled an all-nighter with his sketchbook. Hills Village Middle School is Rafe’s last chance but he immediately finds himself on the principal’s bad side. Rafe learns that his clothes, his art and his attitude violate the school rules. Principal Dwight (Andy Daly) doesn’t care that Rafe is unaware of the rules. Rafe received a copy of the rulebook to memorize. He learns he is not allowed to linger in the hallways or wear bright colors. Rafe’s best friend Leo (Thomas Barbusca) eggs him on, encouraging disobedience. Unfortunately, Rafe will get no slack from the Vice Principal who is just as strict as her boss. 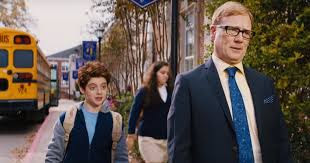 One teacher, Mr. Teller (Adam Pally) has a relaxed and fun classroom. Even in the cool teacher’s class, Rafe crosses paths with a bully. At the Student Council Assembly, things look up when he sees a pretty candidate named Jeanne (Isabela Moner). Jeanne also sees the need for change at this school. Rafe makes an impression because he is the only student to clap for her. The primary focus at Hills Village Middle School is to excel on the B.L.A.A.R. exam. A boring school focused on a standardized test is not the place for Rafe. 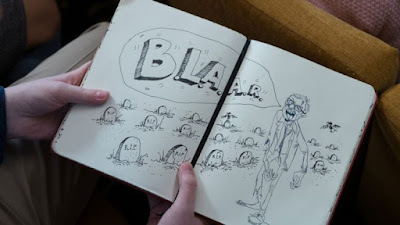 Rafe draws a zombie principal in his sketchbook which lands him in Dwight’s office. Principal Dwight takes the book and destroys it, making an enemy out of Rafe. Soon the “Rules Aren’t For Everyone” movement is born. Rafe decides to break every single rule. His pranks are complicated but effective. Principal Dwight soon has a hat full of paints and the Vice Principal is overwhelmed with balls from a ball pit. As time goes on the pranks get bigger and bolder. At home, Rafe has to deal with his mother’s boyfriend Carl (Rob Riggle). Carl is not impressed with Rafe’s many schools. He reluctantly takes the children out, flirts with the waitress and plots to send Rafe to military school. In the end, the reason for Rafe’s misbehavior will be revealed as the family comes together to support each other. Thankfully, Middle School: The Worst Years of My Life is ridiculous enough to play as complete fiction to my own son. A more impressionable young child might think they could play similar pranks on their own principal. Its seems like I rarely come across a PG movie that is not animated these days so I was excited to add this movie to our Blu-ray collection. My son thought the film was hilarious. I was mildly amused. It takes a sadder turn than I ever expected but my son wasn’t bothered by the drama. If you’re the type to pick apart a film, then skip this one. Everyone should have realized that Rafe was connected to R.A.F.E. It’s pretty easy to see where most of this film is going and that the kids come off as the heroes, and are smarter than the adults. Middle School: The Worst Years of My Life is presented on Blu-ray with an AVC encoded 1080p transfer in a 2.40:1 ratio. The color palette is varied and natural with accurate and even skin tones throughout the film. The film offers a variety of lighting conditions, indoors and out in both night and day and black levels and detail are good. The filmmakers utilized on screen text to give the film a fun, youthful feel. Overall, this is a very good presentation from Lionsgate. 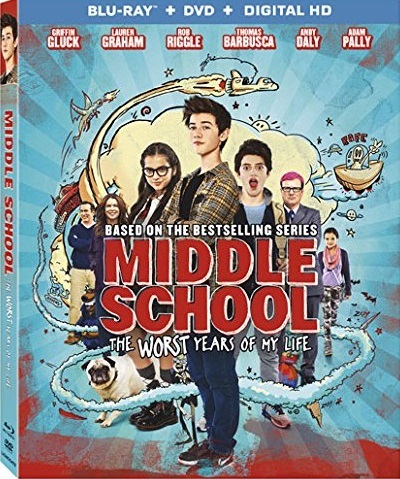 Middle School: The Worst Years of My Life offers a DTS-HD Master Audio 5.1 track. The film itself doesn’t offer many true surround experiences but they have accurately prioritized background crowds. Hallway conversations feel appropriately hollow and dialogue is always intelligible. That Middle School Life – Almost eleven minutes of behind the scenes footage. Middle School = The Worst / Making Movies - A making of featurette with additional and repetitive behind the scenes footage. The Wedgie Wheel – explains the types of wedgies a middle schooler might be subjected to. YOLO: Behind Operation Rafe – An in depth look at the pranks from the film. Gag Reel – Over five minutes of outtakes. 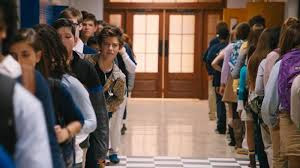 Middle School: The Worst Years of My Life is definitely geared toward the middle school crowd (those children that have no idea how much worse life can get). It’s not as lighthearted of a comedy as I expected with a few really sad moments in the film. For the most part, kids should get a kick out of seeing a peer make a fool out of the principal. For adults, it’s the kind of film you won’t mind watching, just keep an open mind and don’t think it through too much. I recommend the purchase for the youngster in the house, with a warning that pranks at school are not okay.